Lehrer, Jonah. How we decide. Houghton Mifflin Harcourt, 2009. For 35 years, my father designed and tested truck transmissions. Late in his career, his company sent him worldwide to analyze problems for customers. Sometimes he could pinpoint the problem after listening to the engine for several minutes. He always considered himself totally rational and would have denied that emotion could have played a part in his diagnostic skill. How We Decide is about the recent discoveries in neuroscience that explain how decisions are made. Early cognitive science described the mind as operating in a deliberate and rational manner. Yet the mind is composed of a network of different areas, many of which are involved with the production of emotion. When someone makes a decision, emotional impulses influence judgment, no matter how carefully the pros and cons have been weighed. It turns out that the best decisions are a finely tuned blend of both reason and feeling. Every feeling is a summary of data from past experience that is stored beyond the conscious and reasoning brain. The decision maker uses this data without being aware of it. Without emotion, the brain continues to analyze every alternative, never making up its mind. 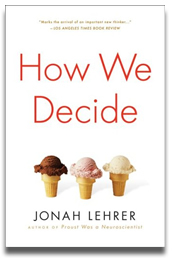 How We Decide answers two key questions: How does the human mind make decisions? And how can we make those decisions better? Even the best minds make mistakes, but the best decision makers analyze their errors and learn from them. This entry was posted by Meg	on Friday, July 31st, 2009 at 2:09 pm	and is filed under Book Reviews. You can follow any responses to this entry through the RSS 2.0 feed. You can leave a response, or trackback from your own site.